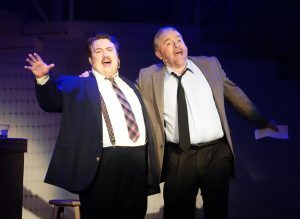 The play is all about fraud, and fantastic as it may seem, it’s based on the real-life tale of a young guy named Frank. 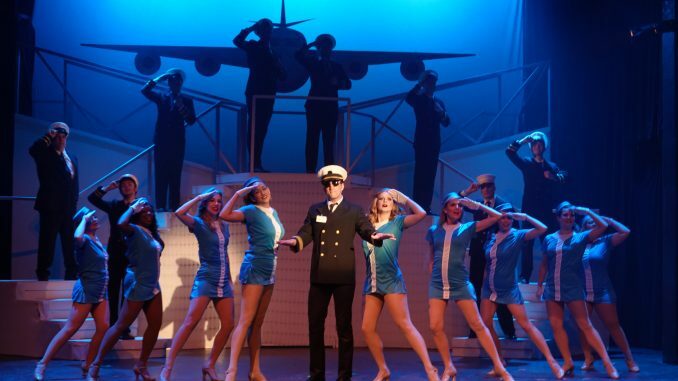 Being performed now at the Georgetown Palace Theatre, Catch Me If You Can is a musical delight from start to finish. In the lead role is the perfectly cast Hal Roberts as Frank Abagnale, who is now 70. Before Abagnale was 21, he committed a series of frauds that netted him more than $2million. He served 4 1/2 years in jail and went on to found a company that advises the FBI and others on fraud issues. If anyone had written it, the story would have been dismissed as too outlandish. It eventually made its way to the silver screen in a 2002 movie starring Leonardo di Caprio. The stage musical premiered in Seattle in 2009, and hit the big time on Broadway two years later, even securing a nomination for Best Musical. The Georgetown Palace pulls out all the stops with a large cast of 26 and an ever-changing set that does justice to the play. Gretchen Johnston has done an excellent job as scenic artist. Despite its underlying message that fraud is a bad thing, this musical is just as much a comedy. Frank’s first adventure in impersonation is as a substitute teacher. He teaches a French class for several weeks before being found out for setting up a field trip to a French fry factory! The fraud that gets the most attention is his time as an airline pilot. The Palace milks this for all its worth, even giving directions to the audience as if they are preparing to take off. 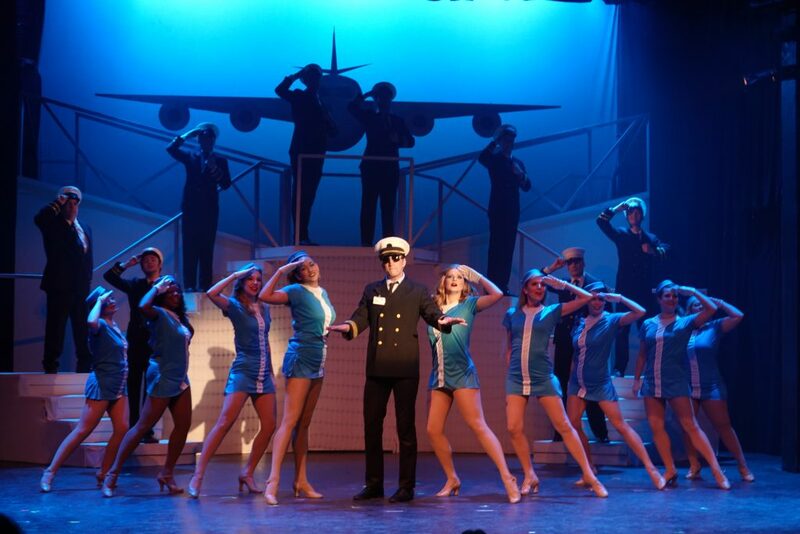 The lead photo depicts a show highlight with an airplane silhouette, Frank in his uniform, and a bevy of stewardesses at his beck and call. He was indeed living the high life. His time as a doctor working in a hospital is made even more hilarious when the nurses sing Doctor’s Orders with lyrics so suggestive they would have made Mae West blush. A real show stopper. Even though the song Fly, Fly Away by Frank’s fiance Brenda could have been written with a sharper pen, its delivery by Kelsey Woolridge is the most powerful of the show. At least the lyrics in this musical rhyme, which is a plus. William Gilbert, playing the FBI man trying to catch Frank, has great delivery and is perfectly believable as a dedicated but ultimately soft-hearted G-man. Bob Baere as Franks’ father acts and sounds a lot like Robert Wagner, which is not easy as Wagner is such a great actor. All the lead actors pack a punch, and are ably supported by the large ensemble cast. Baere, in his role as FBI man Carl Hanratty, describes Frank as “the Johnny Appleseed of fraud.” Appleseed is another larger-than-life character from America whose legend has spawned a musical. Go see this one about Frank Abagnale. It will be the best money you ever lose to a fraud.